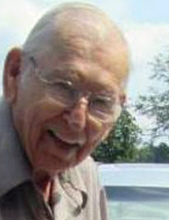 George H. Perry, 89, of Shelbyville, IL, formerly of Findlay, IL, passed away at 7:19 a.m. on Saturday, February 2, 2019 at the Villas of Holly Brook in Shelbyville, IL surrounded by his loving family. Per George's wishes, there will be no services. Family and friends are invited to light a candle or share a story in George's honor at www.lockartgreenfuneralhome.com. To send flowers or a remembrance gift to the family of George Herbert Perry, please visit our Tribute Store. "Email Address" would like to share the life celebration of George Herbert Perry. Click on the "link" to go to share a favorite memory or leave a condolence message for the family.